Review - Murphy USA & Pepsi Float | A Savings WOW! 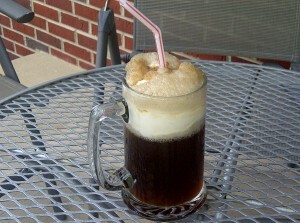 On a warm Summer day like today, what better way to cool off than with a Pepsi float? It combines two of my favorite things – Pepsi and ice cream. I was given the opportunity to visit a Murphy USA location to purchase some of the supplies needed to make my Pepsi float. The first thing I did before leaving the house was to make my list of what I would need to make my Pepsi float, which was Pepsi and vanilla ice cream. Then I stopped by Murphy USA and saw that they have a special going on for their 20 oz. 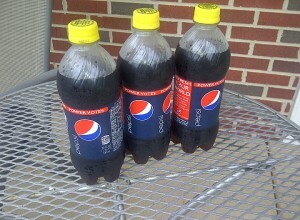 Pepsi products for “Buy 2, Get 1 Free.” Each one was $1.49, so I was able to get 3 bottles for under $3.00. Before leaving Murphy USA, I checked the current gas prices, which is still the best one I’ve seen around the area at $3.78 per gallon for Unleaded without a Walmart Shopping Card or $3.75 per gallon when you purchase it using a Walmart Shopping Card. Since they didn’t carry ice cream at this particular Murphy USA location, we (my daughter and I) went next door to Walmart and purchased some vanilla ice cream. After arriving back home, I made my Pepsi float by pouring some of the Pepsi into a mug and then adding a scoop of vanilla ice cream on top. It’s always fun to see the Pepsi foam up. Then I added a straw for the final touch. 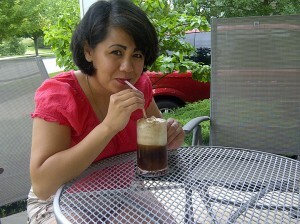 As you can see here, I thoroughly enjoyed my Pepsi float and it made for a delicious treat on this Summer day! Stop by your Murphy USA location, pick up some Pepsi products, and make your own Pepsi floats – enjoy your Summer! View the full slideshow on Intersect.com! Disclosure: This shop/project has been compensated as part of a social shopper insights study for Collective Bias. All views and opinions are my own. Thanks, Mel! I sure did!